If you watch cooking on television, you've probably seen chefs use a crème fraiche in their creations. This simple and popular ingredient is a great way to add a tangy, creamy element to your cooking. Technically, crème fraiche is a type of sour cream that has approximately 30 percent milk fat (sour cream has about 20 percent). To make it, manufacturers add a bacterial culture to sour heavy cream slightly, a process that renders it thicker than typical sour cream. While making it is similar to the process of making sour cream, it contains no added ingredients, and manufacturers monitor each step of the process closely to ensure high viscosity. 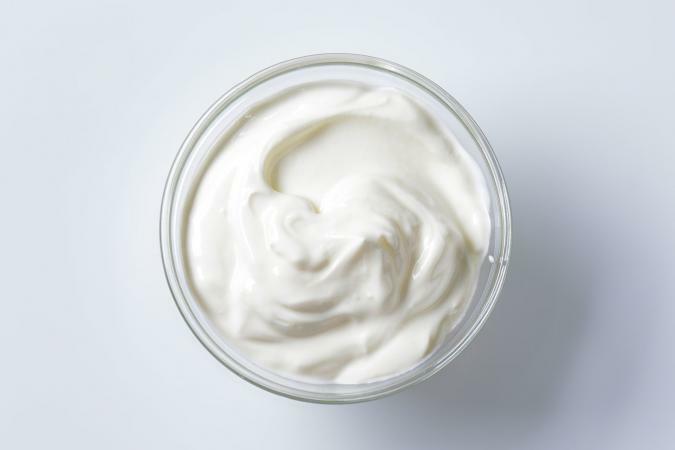 The pH of the fermented end product is about 4.5 (acidic), but the scale in which it's produced and the higher content of fat makes crème fraiche retail for twice that of traditional sour cream. At first glance at a dollop of crème fraiche, it may look like whipped cream. However, once you smell or taste it, you will realize the difference; it has a fairly pungent scent and the taste is sharp, tangy, and slightly nutty. This thickened cream was originally a byproduct of cream before the creation of pasteurization when it was fermented and thickened naturally. These days, the cream ferments under lab conditions, which adds to the cost of the product. Due to differences in the manufacturing process, the flavors and texture of crème fraiche may vary among brands although variations are slight - they may be slightly thinner or thicker, or they may have a bit more tang or a bit less, but in general, flavors are fairly consistent unless you have a very sensitive palate. If you're picky about the flavor and texture, experiment with different brands to find the one with your favorite characteristics. It's used very successfully as a dip, a thickener for soups/stews, in savory and sweet fillings for pastry, or to accompany fresh fruit to accentuate its sweetness. Wherever you use sour cream, you can use crème fraiche, and many people prefer it because it is creamier and less sour. One advantage it has over sour cream is it is somewhat more stable at high temperatures than normal sour cream. 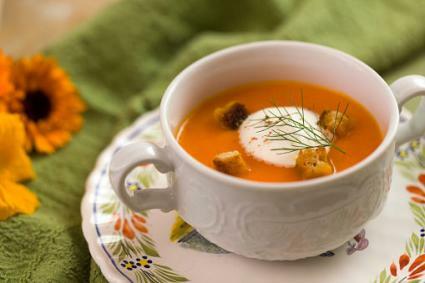 So if you are making something like Hungarian goulash (or any soup or sauce you want to thicken), you can add crème fraiche earlier in the cooking process than you could with traditional sour cream. This allows the flavors to have more time to mingle and infuse. However, keep in mind it is still not suited to prolonged cooking at high temperatures; it is prone to curdling like classic sour cream. With the creaminess of whipped cream, but the tang of sour cream, it is a versatile ingredient. Where Can You Buy Crème Fraiche? Gourmet Food World - If you're baking or cooking for a crowd, the 3-pound container from Beurremont retails for about $30. igourmet.com - Get a 6-ounce jar for just under $7 from Double Devon. Artisanal Foods - Purchase 6 ounces for about $10. When shopping online, you may pay higher shipping prices due to the perishable nature of the creme. Gourmet markets generally carry the product, but you it is also possible to make your own facsimile. You can make something very similar to crème fraiche at home. This is handy if you do not have a local source to purchase it; your result will be similar to real versions, but you won't fool those that are used to eating it. In France, they do not pasteurize heavy cream that is used to make crème fraiche so the natural bacteria are still present; they allow the unpasteurized cream to sit out and age. In the United States the pasteurization of most dairy products is mandatory so you have to make it by other means. There are three acceptable methods that you can employ to make crème fraiche with pasteurized heavy cream. With any of these methods, the results can be whipped like whipping cream. Add one tablespoon of yogurt or buttermilk to each cup of heavy cream and allow it to sit at room temperature for 12 to 24 hours. This method creates a stable crème fraiche that lasts for up to a week. Add a tablespoon of buttermilk (or yogurt) to heavy whipping cream then slowly heat the mixture to 110 degrees. Once heated, place it in a loosely covered bottle and store it in a warm place for at least 8 hours but no more than a few days. This creates a very stable crème fraiche that can stay good for up to three weeks. Combine 2 tablespoons buttermilk with 1 cup of heavy cream (do not whip) then store in a covered glass container. Leave it out at room temperature for up to 24 hours; the live cultures in the buttermilk will begin to ferment and mix with the cream. Stir the cream well and store in the refrigerator for up to 10 days. Crème fraiche is a staple in French cooking but it can be used in many ways. Combine all ingredients then whip with a whisk, mixer, or beater until stiff. Blend berries with sugar until smooth then strain. Heat the puree with 1/4 cup water over medium until thickened. Aerate the crème fraiche in a blender using the whip setting until thicker. Layer a dessert cup with puree, crème fraiche, then cookies, and repeat. If you can't find premade crème fraiche at your local market, or if you are concerned about the methods for creating your own, there are a couple different substitutions you can try. Sour cream is the easiest substitute. No need to adjust the amount; just add the amount called for in the recipe. The result may be slightly runnier - although this will be only a slight difference. The flavor might be slightly more sour, but again the result will be only a slight difference. If you'd like to temper the sour of the sour cream a bit, you can mix it half and half with unsweetened whipped heavy cream. To do this, use a mixer or beaters to whip 1/4 cup of heavy cream until it is light and fluffy and the texture of whipped topping. Fold it with 1/2 cup of sour cream for approximately 1 cup of substitute. The flavor will be milder than crème fraiche, but will still have a pleasing light tang. The texture is similar. Crème fraiche can add creaminess and tang to many sweet and savory dishes. Try this exciting ingredient and see what masterpiece you can create.